Mediaplacement Excited To Announce New Client: QREAM WITH A Q! New York, NY – July 14, 2011 – Diageo plc (NYSE: DEO), the world’s leading premium spirits, wine and beer company, today announced the launch of QREAM WITH A QTM, an ultra-premium cream liqueur. 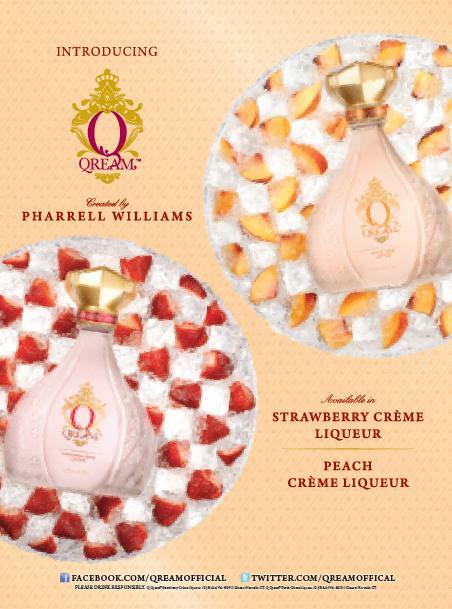 “Qream” was conceived and developed in collaboration with Diageo, by Grammy Award-winning musician, cultural ambassador and style visionary, Pharrell Williams. Williams was instrumental in the development of the cream liqueur – from the taste and bottle design to the marketing and advertising. The innovative alliance will focus on an ethos encouraging woman to “live deliciously,” inviting them to treat themselves royally. With Qream, every detail was crafted to celebrate women – from the elegant design of the bottle, inspired by royalty, to the delicious flavor and silky lightness of the liquid, to how the brand will be marketed. “Qream was created for contemporary women who work hard and want to relax with friends at the end of the day,” says Williams. “I want them to reward themselves “deliciously.” Williams added, “Women make up half the population and Qream is about celebrating that power. To work with Diageo in bringing something original like Qream and the notion of delicious living to market has been a thrill”. The launch of Qream will include an integrated marketing campaign, developed with Pharrell that will live across advertising, public relations, strategic alliances and nationwide events, including programs focused on personal responsibility and responsible decision making when it comes to drinking. Building on his proven track record in music and fashion, the alliance aims to tap into Pharrell’s unique perspective. The beverage itself comes in two varieties, Strawberry Crème and Peach Crème, evoking the flavor of freshly picked strawberries and ripe vine peaches, combined with natural cream and vanilla bean essences to create a light, silky, fruity flavor profile.